I have been seeing on the weather for about a week or so now that Wednesday we are supposed to get chilly temps and the possibility of rain and snow. I was elated. Excited. Enthusiastic! Ecstatic! I couldn't wait for today to get here so that I could get bundled up and go for a run. In the chilly air. I woke up to no snow first thing in the morning 43 degrees and a little bit of wind. Pretty soon it started raining, temps started falling and then it was sleeting. By the time I got ready for my run it was 29 degrees out, windy, and snowing! I dropped off my daughter to play with her cousins and headed out. I couldn't run without them as the snow was blowing right into my eyes. If I put my baclava down my nose froze, put it up glasses fogged over. Pretty soon all the cold wet snow blowing on my forehead gave me an ice cream type headache. You know the one you get from eating ice cream too fast. Half a mile in I realized, this was not what I had envisioned. Snow...yes. Cold...yes. Wind with wet cold snow, not being able to see and an ice cream headache..NO! I wussed out. I turned around and ran home blindly in the driving snow. I stripped out of my layers, into some shorts and hopped on the elliptical. and this was only after a mile. I would have been fine with just the wind or just the heavy wet snow, but the combination of the two was kicking my mood about running in the cold and snow right into the ditch and piling manure on it. My flowers, which have been flourishing, finally, weren't so impressed with the snow. 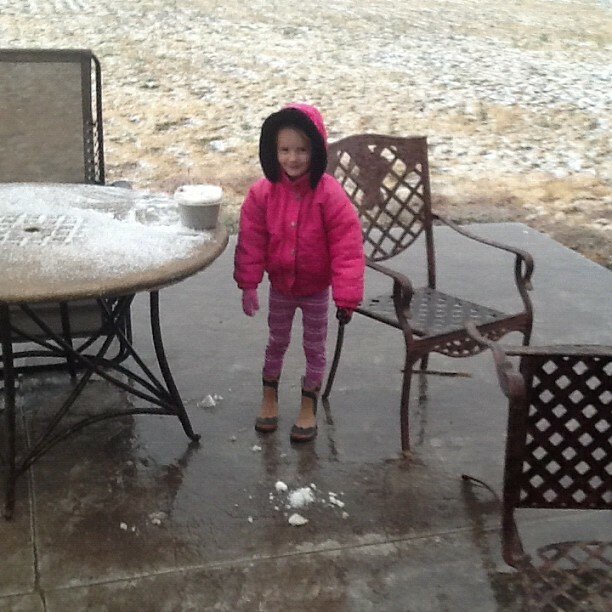 My daughter was so excited to go out and make a snow ball. She wanted me to take a picture of it, but then she dropped it right before I took the picture. I just had the best running day of the year Monday, I guess I couldn't expect perfect winter weather today too. What is your favorite thing about winter running? I like it when it is sunny and in the mid to low thirties. Snow on the ground and hardly any wind. Not like today. Holy crow. That looks terrible. I loooove running in winter here, because it usually means cool air and clouds. The hot finally broke here, and we're only around 80. So I wore boots. Duh. Wow the weather sure made a quick change! I love the winter weather due to the cooler temps but never had any snow. Looks like fun but I am sure the cold on your face must be painful. I think the coldest temp I've ever run in is about 28. I loved it and wished for more! I even enjoy running in the rain because we get so little of it. 67 at 6:00 a.m. today, but I think our hot streak is ending. Its funny I thrive in colder weather, not sure the super cold you get, dont get that much but I would more to WY in a heartbeat! Dont you love the crazy weather during a change over! Oh man, you already have snow?? I'm dreading that. I like cold, but I don't like the slipping and sliding and falling in snow. It's 68 and crazy humid here. I always think of ice on the sidewalks/ground when it's also dark as the worst winter running scenario, but wind can be really bad too. My favorite winter weather....very similar to yours. But I like it overcast--bright sun on snow=headaches for me. OH brrr. I'm SO not ready for winter!! We are having GORGEOUS sunshiney blue skies weather. In the 70s this week....we deserve it though after all the rainy days ahead and earlier this summer. I love the cooler temps for running in the late fall/early winter, but the one thing I really dislike about winter out here in western Nebraska is the wind. Today we're having our first terribly windy day for a while, and it's holding at 30mph...your cold front is heading our way this evening, and we're in for freezing temps and snow in the next day or two. I'm not quite ready for heavy snow, but as dry as this year has been, I'll take moisture in any form! Snow?!? We are into the mid-90's today, all week actually. I'm starting to feel like I'll never be able to run after sunrise again. But snow is going a little too far in the opposite direction for me. Upper 50's to low 60's is just about perfect, I think. i cant believe snow was real!!!! they originally predicted snow for here tomorrow in MN and i just couldnt believe it. now i better be doing my "no snow" dance and hope that it wont be real! haha! you rock for getting out in it to run...i think my body would not be ready to know what hit it! haha! Snow??? Wow! That's crazy to think of snow this time of year! You had it so late last spring it seems. That is crazy! I couldn't even wear a long sleeve shirt today because it got too freaking hot. But I love snow. Not very experienced running in it since it rarely snows here. But I think I would like it just about as much as I do driving in it, which is not at all. Yikes... it is too early! Snow?! Oh my, that's hard to imagine in early October. wow i couldn't imagine snow so soon!at least its clearing up. i also see you have a shirtless photo up- rock them abs! You poor thing--that's awful! I love winter running, too. I love running in the crisp cold, with sunny skies, and I don't mind the snow at all! CRAZY weather!!! I can't believe that you have snow already. Makes me nervous for what this winter could be like. 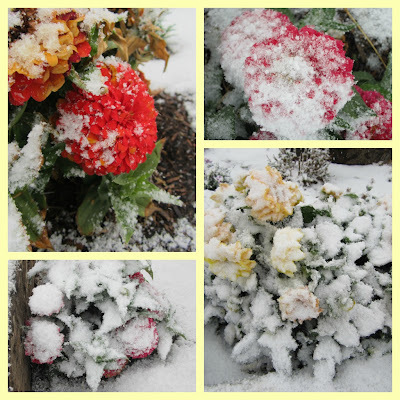 Sometimes we get snow around Halloween, but I hope that isn't the case this year.....Keeping my fingers crossed. crazy weather! Hard to believe it could be snowing somewhere already. I am so complaining about the heat down here and ready for a change. I have never run in snow, but I'd like to try it. Congrats on even getting out the door, not sure I would have even attempted that. I agree on your ideal, I love how pretty everything looks with a little layer of snow. Hoping I can actually use my yak-traks this year as last year was basically zero snow. Wow! What a crazy change in the weather in two days. It must have been really bad for you to have turned around.